They’re created because of the reflection of visceral layer of serous pericardium around great vessels of the heart. The arterial tube encloses the ascending aorta and pulmonary trunk (arterial end of the heart tube). The venous tube encloses the superior and inferior vena cava and 4 pulmonary veins (venous end of the heart tube). It’s a transverse recess behind the ascending aorta and pulmonary trunk and in front of superior vena cava and superior pulmonary veins. It develops because of degeneration of dorsal mesocardium. It has a horizontal passage between the 2 pericardial tubes. On every side it interacts with all the general pericardial cavity. It’s a recess of serous pericardium supporting the base of the heart (actually left atrium). It is enclosed by ‘J-shaped’ sheath of visceral layer of serous pericardium enclosing 6 veins (i.e., 2 vena cavae and 4 pulmonary veins). 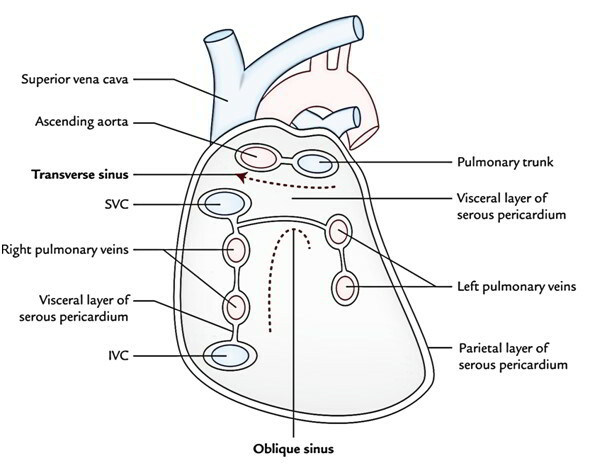 The oblique sinus is akin to lesser sac supporting the stomach and develops as an effect of absorption of 4 pulmonary veins into the left atrium. The oblique sinus permits the distension of left atrium during return of oxygenated blood in it from the lungs. On right side: by reflection of visceralpericardium alongthe right pulmonary veins and inferior vena cava. On the left side: by reflection of visceral pericardium along the left pulmonary veins. Superiorly: by reflection of visceralpericardium alongthe left and right superior pulmonary veins. During cardiac surgery, following the pericardial sac is opened anteriorly, a finger is gone through the transverse sinus of pericardium, posterior to the aorta and pulmonary trunk. A temporary ligature is gone through the transverse sinus around the aorta and pulmonary trunk. The tubes of heart-lung machine are inserted into these vessels and ligature is tightened.